Australia's Highway 1 is the longest highway in the world. It is around 9,000 miles long and circumnavigates the whole country (which I guess makes it the world's longest roundabout as well). 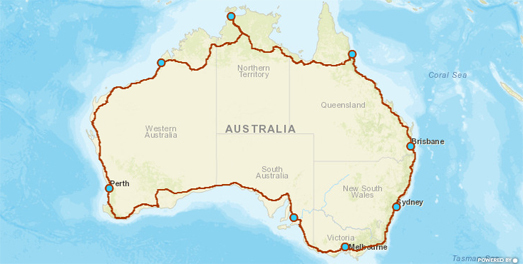 If you've ever wondered how long it would take to travel around Australia's coastline, using the world's longest highway, on the world's greatest road-trip, then you should refer to this Esri story map How Long Would It ​Take You To Drive Around Australia. This Australian road-trip story map breaks up this epic journey into different stages. It also tells you how long each stage of the journey would take to complete. The length of each leg of the journey is compared to other journeys you could make in other locations around the world. For example stage 1 of the journey from Melbourne to Sydney would take nearly 14 hours to drive. About the same time as it would take to drive from Edinburgh to Luxembourg. If after exploring this map of Australia's Highway 1 you actually want to make this epic road trip then it will take you over a week of non-stop driving. If you want to make a few pit-stops on your trip then it will obviously take you much longer.